When is my Collection Time? How many bins can I put out? 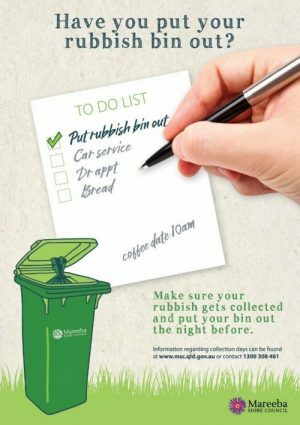 To ensure your waste is collected on your collection day, please ensure that your wheelie bin is placed out adjacent to the kerbside in front of your premises the night before collection. Access to the bin must be unobstructed for collection vehicles. For any inquiries regarding kerbside rubbish collection please call 1300 308 461. Select file to view relevant area. Collection times can vary from week to week. 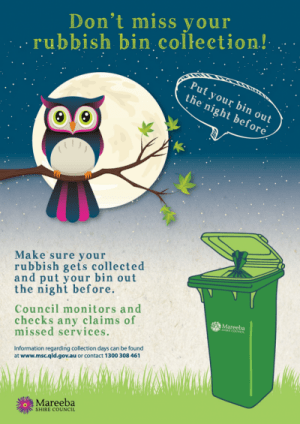 Put your wheelie bin out the night before collection so you don’t miss your service. You may only put out one wheelie bin per residence for waste collection unless you have arranged for additional services with Council. If you have missed your waste collection service, you may take your waste to your local Transfer Station for disposal. Council strives to ensure the most efficient waste collection service for its ratepayers. To maintain a cost-effective service, repetitive claims of missed collections are being monitored by Council. In the event that Council identifies a person making repetitive, non-genuine claims about a missed collection service, the Council may take action under the Environmental Protection Regulation 2008. If you have a genuine missed collection, please call 1300308461. Did you know that on average, each Mareeba Shire household throws out 800kg of rubbish a year in their wheelie bin?